My name is Agnieszka. I live in Poland. My first very important date was ages ago – in February ’85. In Poland there was a winter with a lot of frost (2° F) and snow then. We met in the ruins of the old castle and we kissed, ignoring the frost. 3.5 years later we got married in the monastery shown on this postcard. When we left the church, people were throwing coins for good luck. You have to collect them all, but I didn’t even notice them. Continuing on with our series of postcards, here are a few more for the week. This postcard from Estonia is of the logo used in 2011, when Tallinn was the European capital of culture. I tried to find out why they chose this particular logo, but haven’t discovered anything yet. I’m Junko from Japan. I love animals, walking, nature, traveling, tea & coffee, my lovely cats. On Valentine’s Day, it’s common for Japanese women to give chocolates to men. 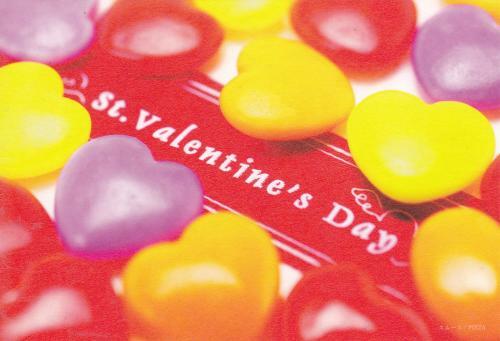 Women are encouraged to express love to men by giving chocolates and other gifts.